NASA'sannouncement yesterday to delay the planned October 2009 launch of itscar-sized Mars Science Laboratory rover until 2011 is the latest example of apervasive problem within the space agency to bail out missions that go overbudget at the expense of other projects, one former NASA official says. "Ithas gotten to be epidemic this decade" among NASA missions, said S. AlanStern, a planetary scientist and the former associate administrator of the NASAScience Mission Directorate (from 2007 to 2008). The jumborover and its cadreof instruments are geared to test the Martian surface for signs of pastpotential habitability, continuing the work of the now-lifeless PhoenixMars Lander and the two Mars Exploration Rovers, Spirit and Opportunity, still trundling across the Martian surface. A majorreview of MSL in October concluded that the rover had a good chance of makingits 2009 launch window, but since then, technical issues and delivery delayshave tossed that out of window. The delays won?t take two years to address, butbecause of the relative positions of Earth and Mars, the next opportunity tolaunch MSL won'tcome until 2011. Those two yearsdo, however, come with a price tag of around $400 million, NASA officialsestimate. And that extra money to keep the already nearly $2 billion projectup-and-running will likely come at the expense of other NASA Mars and planetarymissions, though officials haven't decided exactly how they'll make room in thebudget. Thehardware for MSL, including the rover itself, its cruise stage and the shellthat will protect it as it descendstowards Mars' surface, are "largely assembled," said DougMcCuistion, director of the Mars Exploration Program at NASA Headquartersduring a press briefing on Thursday. But a fewtechnical issues remain to be solved, mainly with the rover's actuators, whichcontrol everything on the rover that moves, including the wheels and roboticarms. All of therover's components must also be put through rigorous testing to make sure that onceMSL arrives on Mars, the mission can "hit the ground running," saidMSL project manager Richard Cook of NASA's Jet Propulsion Laboratory in Pasadena, Calif. "There's a lot of testing still ahead of us." Cook saidthat MSL's complexity and novel landing system and science made it more of anengineering challenge than previous Mars missions, such as Pathfinder, whichwas a "babystep" on the path to "regaining our knowledge of howto send things to Mars." "Thenumber of new challenges were kind of really limited," Cook added.Compared even to Spirit and Opportunity, MSL is "an order of magnitudemore complex," he told SPACE.com (meaning, about 10 times). But Stern saysthat MSL's delay and cost overrun are prime examples of a pervasive problemwithin NASA to "reward" missions that go over-budget and punish thosethat don't. "It isunhealthy" to the entire NASA program, Stern told SPACE.com, and isthe reason he resignedearlier this year from his NASA job. Here is howit happened: NASA's first cost commitment to MSL came in August 2006 during themission's "confirmation review" for $1.63 billion, McCuistion saidduring the briefing. Problems in the middle of 2007 bumped the cost up to $1.88billion. The extra $400 million from the mission delay, which will cover operationscosts through 2014, will bump the lifetime cost of the mission into the $2.2billion to $2.3 billion range, he said. This costis far beyond the original price tag the mission was given, Stern said, withNASA and Congress always upping the ante when asked. And "it's not justMSL" that keeps raising its price-tag, he said. NASAofficials say the reason for the ever-increasing costs is the new ground beingbroken by flagship missions like this, which are attempting things no one hasever tried before. 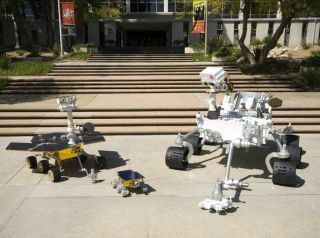 "Wehave not been very good at cost estimates, and I take responsibility forthat," said Charles Elachi, the JPL director. "This has been just avery complicated mission." Costs were extrapolated from past experience,but the newness of the mission meant that extrapolation didn't work well. Sternacknowledges the difficulties in estimating mission costs and that oftenproblems can be unforeseen. "There'salways reasons these things go off track," he said. "Sometimesthey're not even bad reasons." The problemcomes when you "coddle missions that are always over-price." Thiscreates a "psychology" where deadlines and budgets aren't taken asseriously, Stern said. McCuistion,Elachi and other NASA officials cite the importance of the mission science-wiseand the investment already made as reasons to keep MSL going at the potentialexpense of other projects. "Amission like this ranks just behind a manned mission in importance," saidNASA administrator Michael Griffin during Thursday's briefing. "Theinvestment of American taxes payers compels us" to continue funding themission, added Ed Weiler, the current associate administrator for NASA'sScience Mission Directorate at NASA Headquarters in Washington, D.C. But Sternsaid that "sunk cost is a poor argument to make because it doesn't changebehavior." He added: "You can only look to the future cost and itsbenefit." The extra$400 million tacked on to the MSL mission will likely have impacts on otherMars missions, possibly spilling over to other planetary projects, though whatthat impact will be is currently uncertain. "Weobviously haven't had enough time to fully evaluate that," Weiler saidduring the press briefing. "Wethink we can get by without canceling anything," Griffin said. Instead,the agency will likely delay other missions. Money willfirst come from other Mars programs, but if enough can't be found there, whichStern suspects will be the case, other planetary programs will be impacted. "Therewill be some pain in planetary and Mars [programs] to help us get throughthis," McCuistion said. Stern saidthat the options in the Mars program were limited: data analysis of completedmissions (such as the Phoenix Mars Lander, the first so-called Scout mission)could be delayed; operations of the two MER rovers could be cancelled; MAVEN,the next Scout mission could be put on hold. But these options won't free up$400 million, he said. MarkLemmon, a planetary scientist at Texas A&M University who worked on Spiritand Pathfinder, said the he hoped NASA "would protect the integrity of themissions" currently in operation. He addedthat cutting off MAVEN right now would cripple the Scout program: "It'sonly the second Scout mission, and if you start trying to save money there, youeffectively destroy the Scout program." One optionto fill the costs of MSL would be to put off development of instruments thataren't tied to a particular mission. These projects "aren't a huge amountof money but can sometimes be easy targets when the budget gets tight,"Lemmon said. Budget cutshave hit smaller programs hard before, Lemmon noted, particularly in Earthsciences, where satellites aimed at studying issues such as global climatechange have been grounded, even though they are built, because it is cheaper tomaintain them here than launch them. Newmissions could also be affected, pushing them off to "the indefinitefuture," which could delay the relatively rapid pace of Mars discoveriesin recent years, Lemmon said, potentially setting up another lapse in Marsstudy like the 20-year gap between the Viking and Pathfinder missions. Cook isoptimistic though that "the momentum [of Mars science] willcontinue." "Mars will be there for us," whenever we get thereagain, he noted. Any optionswill be taken to NASA advisory committees so the scientific community can voteon which missions they would prefer to defer. "Thisis math that we'll be doing in public, we just don't have the answers for youyet," Griffin said. "We?re going to find the least damaging way thatwe can." Stern saidthat this choice should have been presented to the scientific communityearlier, as soon as the mission topped the $1 billion mark. The choice shouldalso have been presented only to the Mars community, keeping the cost to thosescientists who most support the mission (the same would go for an astronomy orlunar mission, he noted). Above all,what needs to happen is a wholesale change in the handling of over-budgetmissions to preserve the integrity of NASA science missions and roadmaps, Sternsaid. But it will take a number of changes ? simply giving NASA more money or bettercost-estimating won't do it alone. "There'sno magic bullet," Stern said.